Many of you know us as longtime collectors and sellers of antique and vintage Halloween, Christmas, Valentines Day and Easter holiday memorabilia, paper ephemera, antique dolls and toys, fine jewelry and lovely old china and glassware. 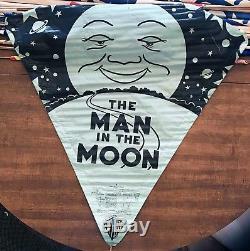 This is an incredible find for the vintage kite and toy collector! This grouping contains 24 new-old-stock kites, most of which are rare and difficult to find. Dating from the late 1950s, early 1960s, and one from the later 1960s, these unused kites all come with their wooden sticks, and are rolled just as they were when offered for sale in one of those great old five-and-ten-cent stores, hardware stores, or toy shops back in the day. These collectibles are so classic in their mid-century designs, which feature atomic, cosmic and space-age imagery. 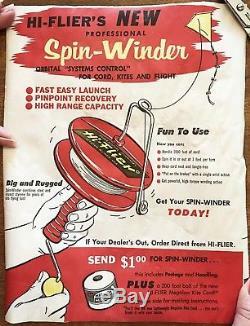 At least two include their rolled-up sales flier featuring Hi-Fliers New Professional Spin Winder Orbital Systems Control. Included here are three RARE, exceedingly difficult to find aqua blue and black Man-in-the-Moon paper kites. The color of these kites is brighter aqua in person than what our photos can capture. The illustration features a smiling moon over a landscape, surrounded by stars and planets, and the words The Man in the Moon. 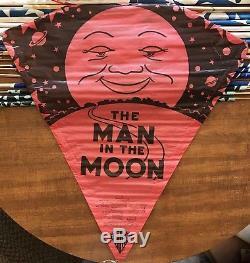 There are also three RARE, red Man-in-the-Moons and six hard-to-find red-white-and-blue Man-in-the-Moon kites. 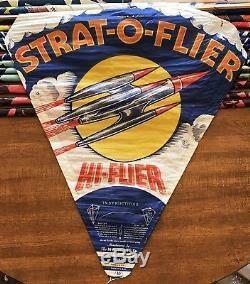 These kites were manufactured by Top-Flite, a division of the Crunden-Martin Manufacturing Co. The aqua blue kites measure 35 long in their current rolled-up form, while the red kites measure about 36 long. The red-white-and-blue kites are larger, and measure about 42 long in their rolled-up form. There are five plastic Orbiteer kites, four of which are blue and one is red. They feature incredible illustrations of orbiting space stations and Buck Rogers-style rocket ships among the clouds and stars. The red one is marked Color Glow, indicating this was manufactured in the later years of the 1960s. 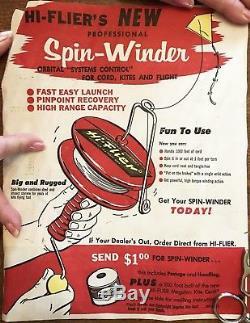 They measure about 36 long in their current rolled-up form and were manufactured by the Hi-Flier Manufacturing Co. These, too, were made by Hi-Flier, and measure about 29 ½ long. 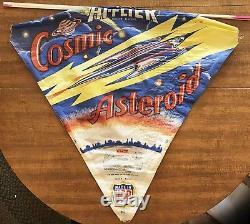 There are two Cosmic Asteroid paper kites, also made by Hi-Flier. They measure about 36 long in their current rolled-up form, and feature iconic space-age imagery of rocket ships, comets and planets. All 24 kites are completely unused and have never been assembled or flown. The only condition issues to report are the expected wrinkling to the paper, and a few light spots of staining from the metal staples however we did NOT unwrap all 24. Most still have their original rubber bands. 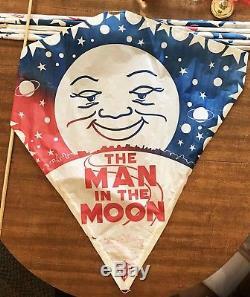 If you are a Baby Boomer, like me, who grew up during the 1950s and 1960s, and remember the pure joy of getting one of these kites high up into the air on a warm spring or summer day, then this grouping of rare mid-century toy collectibles would be a wonderful, nostalgic addition to your collection. How I remember those fun, long-ago times at the beach flying kites like these at the New Jersey shore during my childhood in the 1960s. They are such fantastic reminders of days gone by. They also would be a magnificent resale opportunity. Heres a brief history of these two companies that I found on kitelife. Com: The Hi-Flier Manufacturing Company was founded by Harvey A. He got started by purchasing a patent to a bow kite from a Decatur inventor named Arthur W. Sellers understood the nature and economics of paper kites when he said that a kite not caught in a tree is like an ice-cream cone not eaten. 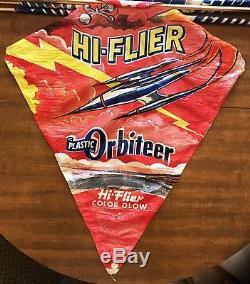 Other companies made paper kites down through the years, but none of them ever came close to Hi-Flier in market penetration. 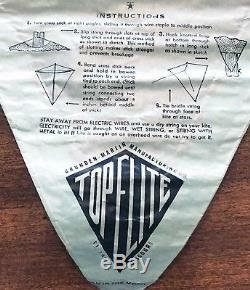 The one best remembered these days is TopFlite, which was a brand of paper kite fielded by Crunden-Martin Mfg. Kites were a sideline for Crunden-Martin and the company did many other things. Their headquarters building in St. Louis is now on the National Register of Historic Places. Crunden-Martin filed for Chapter 11 bankruptcy in 1990 and apparently went out of business (rather than reorganizing and trying again) and its far from clear when they actually stopped making TopFlite Kites. We are thankful for you every day. Please check out our other auctions. Were also happy to arrange for free pick-up if you can come to Lancaster PA. 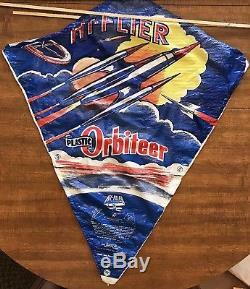 The item "24 NOS Vintage Kites, Mid-Century Toys, Incl. 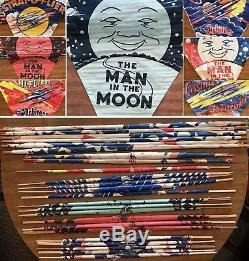 12 Rare Man-in-the-Moon Examples" is in sale since Saturday, January 27, 2018. This item is in the category "Collectibles\Vintage, Retro, Mid-Century\1960s". The seller is "zizsdream" and is located in Lancaster, Pennsylvania.